At the Monterey Bay Aquarium they have this amazing overhead exhibit of sardines circling your head. It's like one continuous silver streak that shimmers and moves. But sometimes we just have to put on the brakes. Put that puppy in reverse and see what happens. Did the world stop? Um, no. I really didn't think it would. Not for me anyway. Here's my worldly advice for what it's worth. Even if it seems the other guys are going against you, stay true to you. Look at the date on this sketch! Done in my very first Moleskine, 2007, for Illustration Friday's word: backwards. Seems to work for reverse as well, no? that's really good advice lolo and a super cool drawing too. and i LOVE that aquarium. you always have the best ideas. and i just realized that illustration friday has a theme. i'm definetly in reverse. hee hee. I love that sardine tank - have watched them for hours. We had a good friend (still have him) who worked there, so we spent much time out there at the museum. It is amazing to be watching a school of fish and all of a sudden a big swathe of them go in a different direction. Kindof like watching a large flock of Starling or other black birds doing their aerial ballet. Pitch perfect illustration and advice. Haven't been to the MBA in an age ... this makes me want to visit and draw too! Excellent message and a beautiful painting. I love those sardines...at the acquarium and here, on your post. You've captured the silvery movement of those wonderful fish...I sat there in awe for a long time and watched them. I wished I could take them home...they were that relaxing for me to watch! Lovely post, lo...stay with the flow! Have a great weekend, dear lolo!! lovely. that is such a great aquarium. my little sardines refuse to go outside today since it's pouring out, we'll see how long they can hold out. love the flow of this painting. you are so wise LO! thanks for sharing your thoughts with us. Lisa said what I was thinking. I see this watching a flock of starlings flying..Interesting how they can get in the same mindset so gracefully. Fun drawing. I'll be the one following Pam, as I am sure *SHE* knows where she's going and I don't! Every Friday I am eagerly waiting to see what your Friday Word interpretation wil be! This is enchanting! Those silvery sardines are gorgeous! And.....I will be there, along with Pam and Anne, swimming against the tide - it's the story of my life! (Even my Blog "swims differently"...as noone but you can get it onto their blogroll!) Ha-ha! Those are fitting words and a great visual. 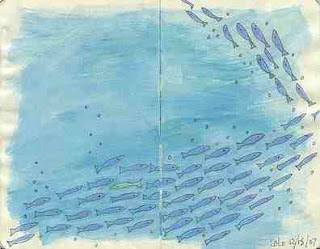 I love to watch schools of fish or flocks of birds that swarm in unison. It is so amazing to watch and yes, you are right, there always seems to be one or two who are off on a different tangent. Sweet wonderful words. Love the painting, it must be an awesome place. So cute and beautiful painting. The post tells very important thing. Thank you!! Lovely illustration and great text! You have such amazing banners, too! A delightful response to the topic! Nice take and nice work Lolo! Heisann! What a good idea for this toipc!